County fairs across Northeast Ohio are scheduled to take place over the next few months. Fairs offer a wide variety of entertainment options and are events that truly are fun for all ages. 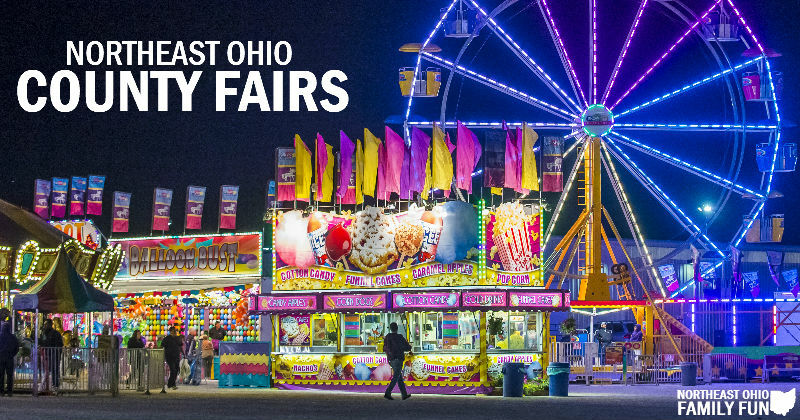 Check out the list of upcoming Northeast Ohio County Fairs below and plan an outing to one near you! Tuesday, August 7 BOGO (Buy One Get One) Fair Admission for all age groups. Saturday, August 11 – $2 Admission from 10am-Noon for Family Day. Note that you must be through the fair gates by noon to receive the discount, so plan to arrive early to account for traffic and lines. Tuesday, August 28 – $5 Reduced Price Gate Admission. Children under 3 are FREE with an adult. Reduced price admission does not include rides. Friday, August 31 – FREE Gate Admission for Kids 14 & Under with an Adult. $10 Discounted ride wristbands all day on Kid’s Day. Monday, September 3 – FREE Gate Admission with Military ID. Rides are not included with free admission. Monday, September 3 – $5 Reduced Price Gate Admission. Children under 3 are FREE with an adult. Reduced price admission does not include rides. Weekend Fun – Events and Activities to make the most of your weekend!